Today will be a record setting Election Day for sleepy outcomes. A new Assembly representative Annette Chaparro is headed to replace Carmelo Garcia. That in itself is reason to celebrate. There's one anticipated race however where the phone lines will be burning up with yelling, cursing, threats for one wannabe Chair of the Hoboken Democratic Committee. She can do all the above and it won't change a thing. Once in a while, you can't even repurchase the people you thought you had bought. It's going to be a real scream. 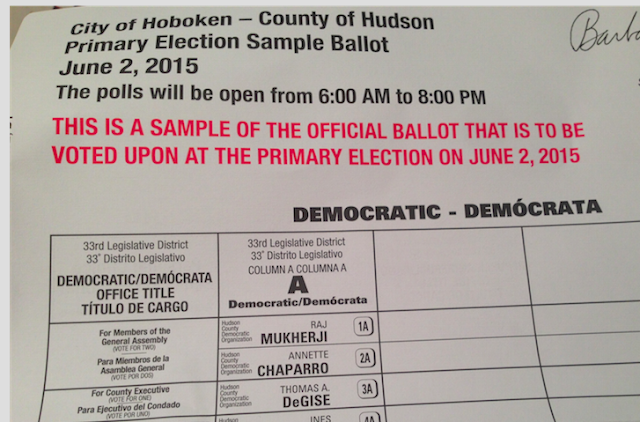 Yesterday, Grafix Avenger noted the uptown races where registered Democrats can make a difference. Talking Ed Note: In other places, you can muck up the works by voting a personal choice candidate. A few neighbors doing so will likely upend several races and MSV hears there could be some interesting outcomes as some registered Democrats do so. If you and your neighbors are so inclined, choose one among you and write-in their name for the committee selections below the County Executive. The first rule of Operation Mayhem. We don't talk about Operation Mayhem. The second rule of Operation Mayhem? We don't talk about Operation Mayhem. The third rule? We get names and organize write-in votes for Operation Mayhem.